Arizona State University’s innovation winning streak has continued among its next generation of talented faculty. Three ASU researchers — more than any other university in the nation — have been awarded part of $20.6 million in total grants funded through the U.S. Air Force’s Young Investigator Research Program (YIP). 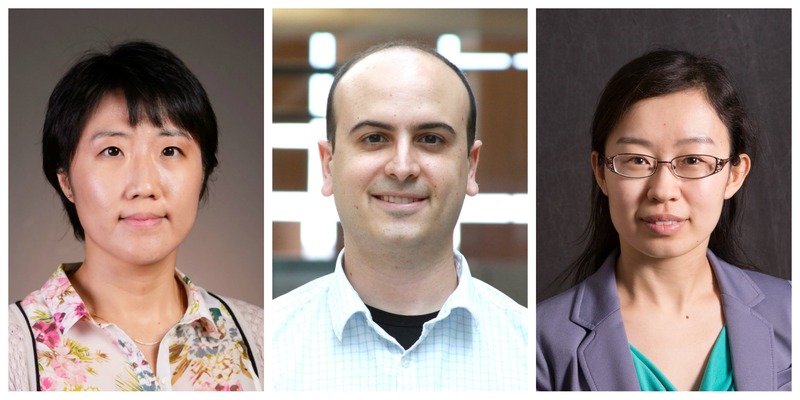 ASU assistant professors Ximin He, Nicholas Stephanopoulos and Yu Yao will use the three-year YIP awards to pursue groundbreaking discoveries and develop new building blocks and high-performance devices for nanotechnology applications. Ximin He and Nick Stephanopoulos are new faculty under ASU Biodesign Institute’s Center for Molecular Design and Biomimetics, directed by Hao Yan, a past Air Force YIP recipient and recognized leader in bio-nanotechnology. Yan uses DNA and other basic building blocks to build novel nanotechnology structures at a scale 1,000 times smaller than the width of a human hair. Yu Yao is a new faculty member in the Ira A. Fulton Schools of Engineering, in the School of Electrical, Computer and Energy Engineering, and also a member of the Center for Photonics Innovation. Her current research focuses on developing nanoscale devices with unprecedented performance and unique properties based in part on semiconductor technology and emerging materials. During her doctoral studies at Princeton, she developed novel designs for chemical sensing in the environment, a technology called mid-infrared quantum cascade lasers. More recently, she successfully demonstrated high-speed infrared detectors and modulators based on optical nano-antennas and graphene during her postdoctoral work at Harvard. The Air Force’s YIP program is open to scientists and engineers at research institutions across the United States who received PhD or equivalent degrees in the past five years and who show exceptional ability and promise for conducting basic research. The YIP program fosters creative basic research in science and engineering, enhance early career development of outstanding young investigators, and increase opportunities for the young investigators to recognize the Air Force mission and the related challenges in science and engineering. ASU received three awards out of 56 scientists and engineers from 41 research institutions and small businesses. AFOSR received more than 265 proposals in response to the AFOSR YIP broad agency announcement solicitation in Engineering and Information Science and Physical and Biological Science research areas. These vital areas of research include: Engineering and Complex Systems, Information and Networks, Physical Sciences and Biological and Chemical Sciences. Emerging Artists is a series of dance performances featuring choreography from the graduating MFA in Dance students in the ASU School of Film, Dance and Theatre. These thesis projects are the accumulation of several years of study, exploring a variety of issues through movement, interactive media and performance. Alvarez’s work, “It’s My Party,” is an immersive multi-media production that focuses on understanding the social and personal issues surrounding HIV stigma. Drawing from a series of round table conversations with newly diagnosed HIV+ young adults, Alvarez seeks to illuminate how HIV+ individuals find empowerment and personal acceptance. Gerena’s production, “Flesh Narratives,” is series of 5 distinct pieces that explores the power of personal narrative and storytelling as told through the language of the body. The interplay of creation and destruction, the transformation of seasons and the transformative power of water are examples of themes explored in each work. Tickets are $16 for general admission; $12 for ASU faculty, staff and alumni; $12 for senior citizens; and $8 for student. Tickets can be purchased online or by calling 480-965-6447.